1. J. W. WAYNE, editor of the Griswold American, was born at Platteville, Grant County, Wis., on November 12, 1854, and came to Iowa in 1876, and Cass County in 1881, locating at Marne where he embarked in the grocery business. In 1893 he became editor and publisher of the Marne Free Press and continued in that capacity till 1899, when he assumed control of the Griswold American. Associated with him in business are his two sons, L. D. and Chas. O. WAYNE. Mr. WAYNE has one other child, a daughter. The Messrs. WAYNE are genial gentlemen and enterprising newspaper men. They are giving to the people of Griswold and vicinity a good, clean newsy paper, and are entitled to success. 2. 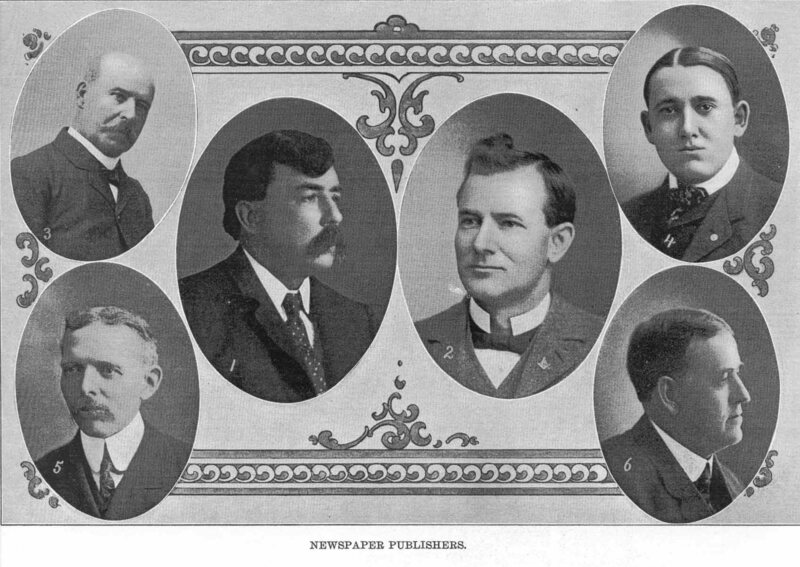 Sherman F. MEYERS, proprietor and publisher of the Anita Tribune, was born in Fairfield, Ia.,November 4, 1864, his parents being Dr. J. L. and Mrs. Eliza Coomes MEYERS. In 1878 he entered the employ of Charles F. CHASE in the old Anita Times and learned the printing business under his instructions. Later he became the publisher of the Anita Times and on the 20th of December, 1883, he established the Anita Times, which he still runs and publishes . He was appointed postmaster under President McKINLEY and was reappointed at the expiration of his term and still holds the place, He is one of the brightest newspaper men in the state and has a large and loyal following of personal and political friends. 3. Geo. W. B. FLETCHER, editor and publisher of the Lewis Standard, was born in Bedford County, Pa., January 20, 1846, and attended the common schools of that locality till he was seventeen years of age. He attended a number of seminaries and normal schools for some years, working on the farm meanwhile during vacation. He completed his education and came to Iowa on April 7, 1874, and to Cass County on October 15th of the same year, principal of the Lewis schools in ’88 and ’89. July 1, 1893, he was appointed postmaster at Lewis by President CLEVELAND and served in that capacity four years. On November 1, 1899, he purchased the Lewis Standard and has been the editor since. Mr. FLETCHER is a genial gentleman , a progressive man and citizen ,and has a host of friends. 4. Edwin Percy CHASE, city editor and business manager of the Atlantic Daily and Weekly Democrat, was born in Anita , Iowa, November 2, 1879. When about a year old he came with his parents to this city, where his father, Chas. F. CHASE, embarked in the Cass County Democrat. The subject of this sketch attended the Atlantic public schools, was graduated from the Atlantic High school, and in 1900 went to Denver, Colo., where he resided two years, being employed in the newspaper business and in the county offices in that city. He remained there two years, returning to this city in the spring of 1902. When in 1903 the Democrat Publishing Company was organized and purchased the Democrat of A. GARDNER & Sons. He was made the secretary and treasurer of the company and is now serving in that capacity. 5. E. H. GRIFFIN. The subject of this sketch is a native of the State of Iowa. He was born in Cedar Falls, Black Hawk County, April 17, 1858. When four years old his parents moved onto a farm near that place where he grew to manhood and cast his first vote as a farmer’s boy. Circumstances were such, owing to sickness in the family, that he was not able to take advantage of the district school after he reached the age of thirteen and he gained the knowledge sufficient to enable him to secure his first certificate to teach by tying a text book to the plow and learning as he could in that way. After a couple of terms in the country schools as a teacher he finished a course at the State Normal school and added to the education obtained there by study at the State University. For a number of years he acted in the capacity of teacher, filling the position of superintendent of schools in Sigourney and Bedford, Iowa. IN his work he was successful , but he had a desire to come into touch with the world as it was, a little more closely and believing that he had something of the newspaper man in him entered into that field of work through the purchase of the Atlantic Messenger, where he is now located. Political honors have never appealed to him very strongly, but last winter he was elected to the position of member of board of trustees of the State Normal school. 6. Charles F. CHASE. Managing editor of the Atlantic Daily and Weekly Democrat, was born in Prairie du Chien, Wis., October 28, 1854, and at the age of 10 years began work as a “ devil “ in the Prairie du Chien Union office. In 1867 he went with his parents to Southern Illinois , where his father engaged in the fruit business. He learned telegraphy and was in the employ of the St. Louis & Southeastern Railroad for a number of years. In the early 70’s he returned to the printing business and was employed on the Rock Island Argus and the Davenport Democrat. He finally entered the employ of Hon. John P. IRISH on the Iowa City Press and remained with him until 1877, when in the company with Claude FAUST, long deceased, he established Anita’s first paper, the Times. In 1880 he came to Atlantic and founded the Cass County Democrat, and with the exception of the years the paper was owned by GARDNER & Son, to whom it was sold in 1894, has been connected with it ever since, taking the position of managing editor when the paper was purchased by the Democrat Publishing Company in January, 1903. He was a member of the Democratic State Committee six years, its treasurer two years and chairman of its executive committee one year. In 1893 he was appointed postmaster of Atlantic by President CLEVELAND, and held the position four years and two months. From: Exposition Souvenir Album, published by Democrat Publishing Company, Atlantic, Iowa, 1904. Transcribed by Brenda Magee, June, 2010.